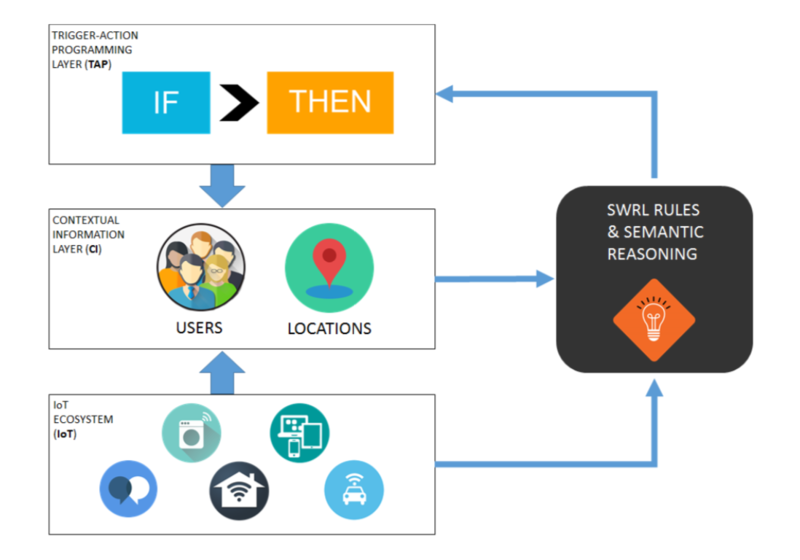 Various programming environments for End-User Development (like IFTTT) allow the composition of Internet of Things (IoT) applications, i.e., connections between IoT objects to personalize their joint behavior. These environments, however, only support a one-to-one mapping between pairs of object instances, and adopt a low level of abstraction that forces people to be aware of every single technology they may encounter in their applications. As a consequence, some open questions remain: would a "higher level" of abstraction help users creating their IoT applications more effectively and efficiently compared with the contemporary low-level representation? 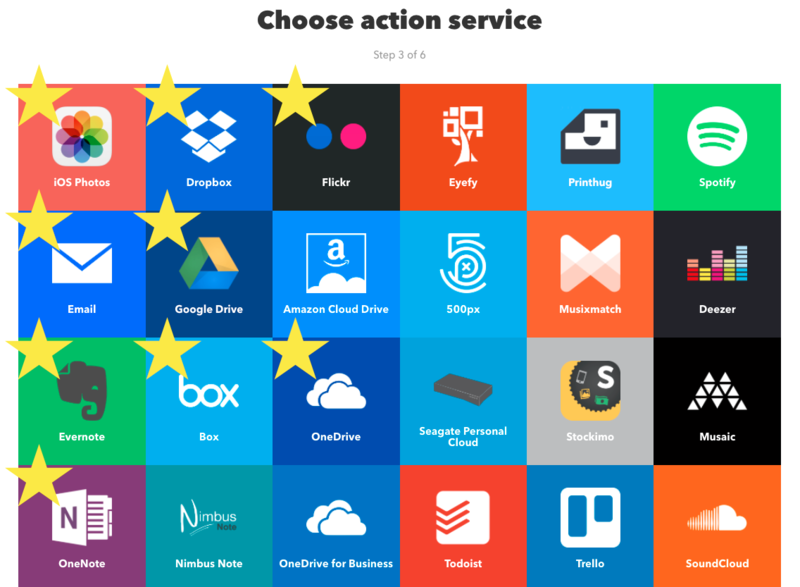 Which representation would users prefer? How such high-level IoT applications could be actually executed? The paper A High-Level Semantic Approach to End-User Development in the Internet of Things, to appear in the International Journal of Human Computer Studies, answers the previous questions by introducing EUPont, a high-level semantic model for EUD in the IoT. EUPont allows the creation of high-level IoT applications, able to adapt to different contextual situations. By integrating the ontology in the architecture of an EUD platform, the paper demonstrates how the semantic capabilities of the model allow the execution of high-level IoT applications. Furthermore, the approach was evaluated in a user study with 30 participants, by comparing a web interface for composing IoT applications powered by EUPont with the one employed by a widely used EUD platform. Results show that the high-level approach is understandable, and it allows users to create IoT applications more correctly and quickly than contemporary solutions. 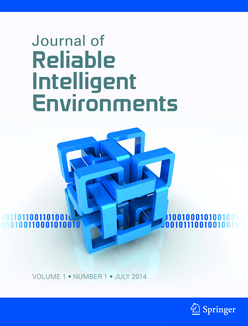 The Journal of Reliable Intelligent Environments (Springer, ISSN: 2199-4668) issued a Special Issue on the topic: "Reliability on Pervasive Well-being: will it soon become a reality? - State of the art and open issues". Pervasive well-being includes integrated software and hardware technologies that allow anyone at any time and in any place to monitor their activities, to enforce their habits, to maintain a healthy lifestyle, thus increasing their quality of life. The development of pervasive well-being systems is a challenging task, mainly due to the need of integrating diverse software and hardware components, each of them with a high degree of complexity by themselves.The focus of the call is on the overall systems properties providing reliable solutions to pervasive well-being, and not just the individual sensors or wearable devices. Techniques methods applicable in any step of the design and validation flow are key topics of this Special Issue, being its main objective their application to ensure higher safety, security and reliability levels for IE used in pervasive well-being context, and as a consequence increasing user confidence in them. 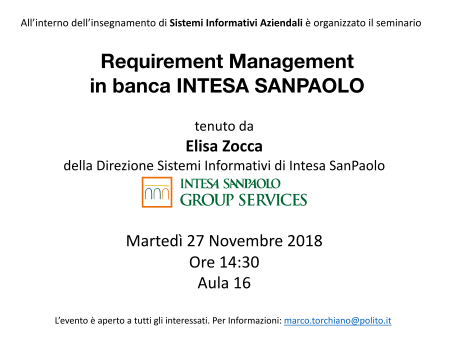 Come parte integrante delle lezioni di Sistemi Informativi Aziendali, Martedì 27 Novembre 2018 alle ore 14:30 in Aula 16 si terrà un seminario dal titolo "Requirement Management in banca INTESA SANPAOLO", a cura di Elisa Zocca della Direzione Sistemi Informativi di Intesa SanPaolo. 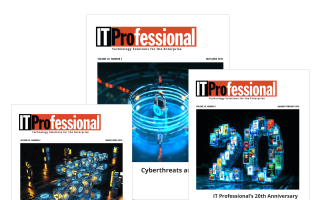 IT Professional plans a September/October 2019 special issue on Synthetic Realities. Synthetic reality typically harnesses sensors for orientation and scene integration, and often aggregates sensor data for registration and calibration. It then uses advanced computation, involving machine learning and complex models to render the results, often employing sophisticated display technology to integrate them with the real world. The special issue seeks contribution covering the whole spectrum of synthetic realities in the reality-virtuality continuum: Virtual Reality, Mixed Reality, Augmented Reality, their technologies and their applications. Submission deadline by February 1, 2019.